Summary: Worldwide, the number of seminaries seems to have grown significantly over the last century. Currently, only one in five seminaries are located in Europe and North America. Countries with the most seminaries are India (1,096 seminaries), Brazil (1,010 seminaries), and Italy (407 seminaries). 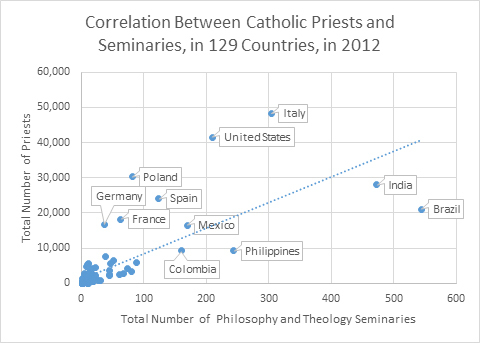 A strong, positive correlation exists between the total number of priests and the overall number of philosophy and theology seminaries. 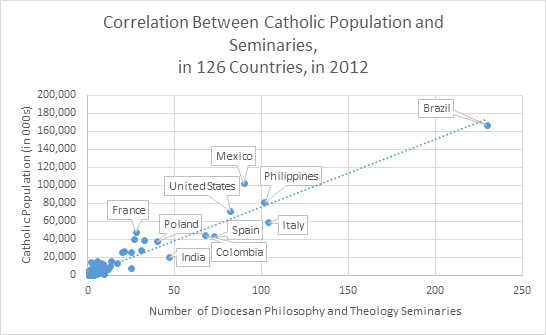 Likewise, a strong, positive correlation exists between the size of Catholic population and the number of diocesan philosophy and theology seminaries. CARA is releasing the Directory of Catholic Seminaries (see the links at the bottom of this post) containing a wealth of information about seminaries around the world. Michal Kramarek, Ph.D. led the research for this project and is the author of this post. The Catholic Encyclopedia published in 1912 includes a list of English-speaking seminaries throughout the world. The Annuarium Statisticum Ecclesiae from 2012 includes a list enumerating seminaries in virtually all countries around the world. The table below compares the data from these two sources. Overall, the number of seminaries increased significantly over the last century in eight countries where the data is available. This is mostly due to the change in the number of seminaries in India and United States. In three countries the number of seminaries is the same or almost the same: Great Britain, Ireland, and New Zealand. 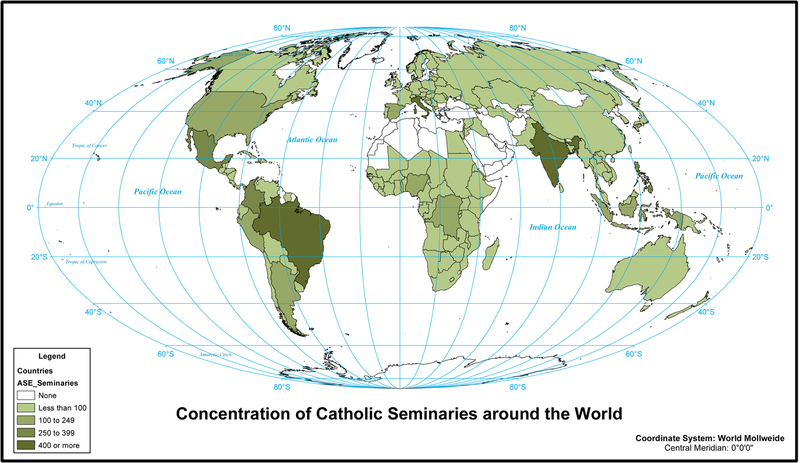 Using the data from the Annuarium Statisticum Ecclesiae for 2013 allows one to map the concentration of Catholic seminaries around the world. The underlying data covers 95 percent of all ecclesiastical jurisdictions around the world. The data used here is a sum of all seminaries and residences, seminaries for diocesan priests and religious priests, secondary school programs as well as philosophy and theology programs. Thus, the number of seminaries here tends to be higher than the number of seminaries-institutions in each country. It should be also noted that the map (click on the map to see a larger version) combines Taiwan, Hong Kong, Macao, and Mainland China. The underlying data includes ten seminaries spread between Taiwan, Hong Kong, Macao but the number of seminaries in Mainland China is not available. The median number of seminaries is 12 and the average is 48 per country for all countries where a seminary can be found. Countries with the most seminaries are India (1,096 seminaries), Brazil (1,010 seminaries), and Italy (407 seminaries). Only one in five seminaries (20 percent) is located in Europe (16 percent) and North America (four percent). By comparison, 29 percent of seminaries are located in Asia and Oceania, 27 percent in South America, and 16 percent in Africa. The growth of the Catholic Church in the global south is seen by a larger number of seminaries in the Democratic Republic of Congo (159) than in Poland (90), a larger number in India (1,096) than in Italy (407), a larger number in Columbia (277) than in the United States (243). In South America, the highest number of seminaries can be found in Brazil (1,010 seminaries), Colombia (277 seminaries), and Peru (152 seminaries); the fewest seminaries can be found in Suriname (two seminaries) and Uruguay (seven seminaries). Using the data from the Annuarium Statisticum Ecclesiae for 2012 allows for an exploration of the statistical relationship between the number of seminaries (i.e., including both seminaries and residences) and the number of priests. The table below captures this relationship using correlation coefficients. Correlation coefficient can vary in value from -1 to 1. A value of more than 0.5 indicates positive, moderate relationship. A value of more than 0.7 indicates positive, strong relationship. There is a positive, strong correlation between the number of bishops and the overall number of philosophy and theology seminaries and residences in countries around the world. There is a positive, strong correlation between the number of diocesan priests and the number of diocesan philosophy and theology seminaries and residences in countries around the world. There is a positive, strong correlation between the number of religious priests and the number of religious clergy philosophy and theology seminaries and residences in countries around the world. The correlations are relatively weak between secondary seminaries (both, religious and diocesan) and the number of priests (and bishops). A strong, positive correlation exists between the total number of priests and the overall number of philosophy and theology seminaries. This correlation is stronger for religious priests and weaker for diocesan priests (see the table above). Countries with the highest total number of priests are Italy, United States, and Poland. Countries with the most philosophy and theology seminaries are Brazil, India and Italy. Countries with the highest number of priests per seminary (philosophy and/or theology) are South Africa, Taiwan (China), and Ireland. Using the data from the Annuarium Statisticum Ecclesiae for 2012 allows one to explore the relationship between the number of seminaries and the size of general population. The correlation between all variables is positive and ranges from 0.24 to 0.96. The correlation between general population and the number of seminaries is relatively weak. There is a positive, strong correlation between Catholic population and the total number of seminaries. Most notably, there is a very strong, positive correlation between the number of diocesan philosophy and theology seminaries on one side and the Catholic population on the other side. A strong, positive correlation exists between the size of Catholic population and the number of diocesan philosophy and theology seminaries. This correlation highlights the geographic balance of developing seminary education where the Catholic population is present. Countries with the biggest Catholic population are Brazil, Mexico, and Philippines. Countries with the most diocesan philosophy and theology seminaries are Brazil, Italy, and Philippines. Countries with the highest number of Catholics per diocesan philosophy and theology seminary are Tanzania, South Sudan, and Honduras. 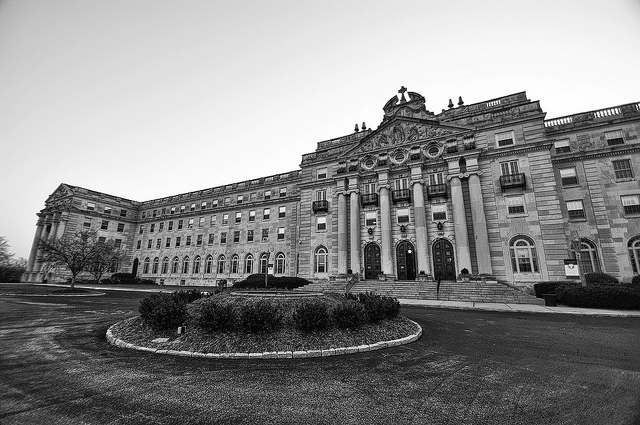 Photo of St. Mary's Seminary & University in Baltimore courtesy of Forsaken Fotos.